Who knew?! This is what I saw when I arrived at the show last night. 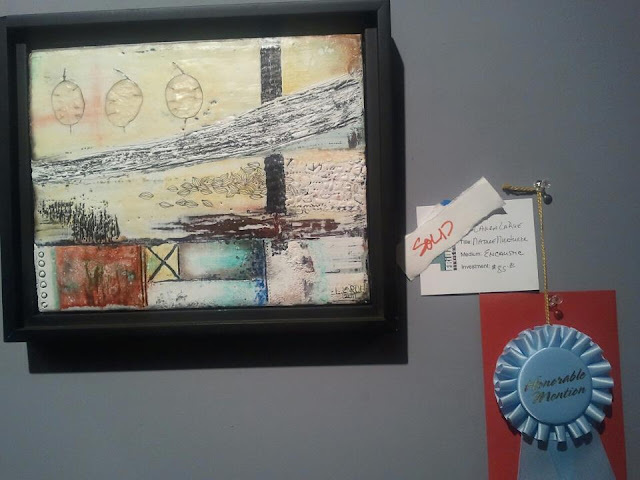 Not only did I receive an honorable mention but someone actually bought my artwork! I was positively giddy. I tried to hide it a little. I told myself not to make a big deal about it but I don't think I did a very good job. It is so flattering to think that someone else appreciates this piece just as much as I do. At the same time I never, in a million years, expected to sell anything so I was totally unprepared to part with it. ﻿It's a weird mix of emotions. I am so happy but at the same time I feel like I've lost something important. So today all I kept thinking was that I must make more! I must get into the studio and keep working. In my last post I said that I was stuck and I was hoping for an epiphany. Well, I did! Okay maybe epiphany is a strong word but I did have a breakthrough. And tomorrow when it's light out I will take some photos so I can show you what I have been working on. There are times when things start rolling as we say! So enjoy it! I know parting with your work might be difficult but hopefully the person who bought it will love it as much as you did!AriadnefromGreece! Yay! Congrats! I can relate with not being able to part with artwork. I never wanted to show my paintings because of that-way too attached. But it's funny, with my metal work, I find I can part with it no problem! That painting is beautiful, it makes me think of a windswept beach landscape. and your response is the only one: make more! I am not at all surprised! You are an amazing artist. So happy for you! Sorry I have been so absent lately. I am planning to improve!